We did two dinners with the six wines we were given for this month’s Argentinian exploration. The first was based on a recipe my language instructor taught me when I spent 3 weeks learning Arabic in Tunisia two summers ago. I’ve seen shakshouka trending a little on Instagram lately and I’m glad that other people have joined the Tunisian food party. It’s a great meal that works well for both brunch and dinner and it’s been a regular staple food around our house since I got back. Tunisian food is fantastic and if you’re into the Mediterranean diet, it’s a great way to add some additional flavor and lots of spice. It’s also a flexible dish that lets you use up some of the things in the fridge in a fun way. The next night we were looking for another rich, warm and healthy meal. Bean chili fit the bill for a cold winter night (don’t @me on this one – chili doesn’t require meat to be good!). Figuring out an appetizer to pair with Chardonnay which was also meatless required me to think outside the box a bit. We’re big seafood eaters and shellfish and Chardonnay are a natural match but I was trying to keep these meals veg. Stuffed mushrooms were exactly what we needed here. The umami and texture paired nicely. Intense medium salmon pink, dry with very crisp acidity. Moderately intense nose shows chalk/wet rock, melon, kiwi, strawberry and white floral notes with a hint of creamy cherry. The palate closely follows the nose with a little cream, strawberry, wet rock and cherry. This is a very full-bodied rosé that integrates the fruit and mineral notes with well-balanced acid and sugar. The fruit lingers on the palate for quite a long time. This is an excellent value rosé that drinks very nicely now but also has some potential to age. We’re planning on laying down a bottle or two and seeing how it does. At a suggested retail price of $11, this is a great wine to pull out to share with friends or to rosé all day with. It’s also structured enough to pair with foods. I would try it with Mediterranean dishes like we did, ceviche, grilled chicken and sausage. Bonus: it’s also organic. A lovely lighter-bodied red. The wine does not see any oak, so it’s a different, and very fresh expression of Cabernet Sauvignon. The color is deep purple with medium acidity and medium tannin. It has a medium intensity nose that shows black raspberry, cherry, green pepper, strawberry and some baking spice. The palate is similar in intensity with more red and black fruit, some spice and a bit of the green pepper. This is a simple, refreshing and easy-drinking Cabernet. This isn’t built to age but is a very pleasant value bottle which is drinking well right now. It’s a fun wine that has a lot of flexibility. 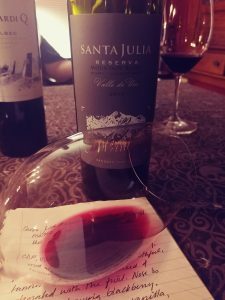 If you don’t usually care for Argentine wines because you’re not a fan of the big, tight Malbec styles which are common in the US market, give this one a try. It also has a suggested retail price of $11, so it’s a great wine to have on hand for a party or just for a great week-night wine with a quick meal. 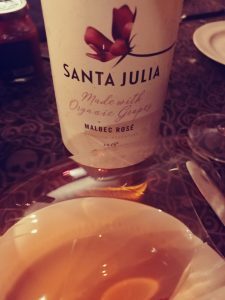 Like the Santa Julia rosé, it’s organic. The medium level of the acids and tannins made it a nice match with the spice in the shakshouka so you can reach for this wine with Mexican food or meat in a zingy barbecue sauce. I didn’t realize that Bonarda was grown in Argentina until this wine arrived. It’s a nice expression of the grape. Long maceration gives the wine a lovely deep ruby hue with some hints of violet. Medium+ acid, medium silky tannin give the wine a smooth and supple mouth feel. It has a soft nose of cherry, blueberry, plum, menthol, vanilla, roast meat and smoke. The palate opens up with a bright note of lemony acid. The fruit is a little less pronounced on the palate than on the nose. Minerality, a bit of sanguinity and smoke dominate the palate, followed by dried black cherries, blueberry and vanilla. 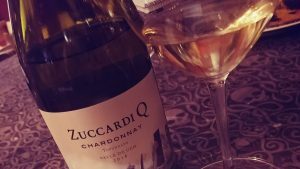 Only a portion of this wine sees oak, and the subtle use of oak helps to structure the wine while leaving it feeling fresh and bright in your mouth. The finish is moderately long. This is another approachable wine that’s best to drink on the younger side. Medium lemon in color with a lovely bright high acidity. The nose on this wine is very intense and shows lemon, ripe green apple, pear, fresh butter, vanilla, wet rock, yeasty bread and lime curd. 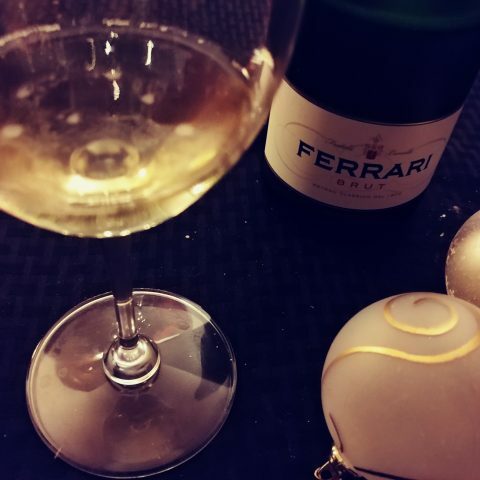 The palate has similar intensity and is dominated by lemon, lime curd, baked apple and fresh whipped cream. Aging sur lie gives the wine a wonderful creamy mouth and a very long finish. The oak and lees contact are nicely balanced but the lack of malolactic fermentation leaves the wine feeling fresh and rich rather than heavy. The wine is very well balanced and is just starting to show some hints of development. This is a beautiful example of Chardonnay which is drinking very nicely right now but also has some potential to age a bit. This is a wine that loves food. Another bonus: it kept very nicely overnight and was quite enjoyable on a second day of drinking. Very deep purple color with high acid and high tannin. Medium+ warming alcohol. Fruity but dry. Very intense nose of candied raspberries, red and black cherries, bramble fruit, nutmeg, cinnamon, vanilla, smoke, a lovely lingering herbal note at the end. The palate is also very intense showing the warming alcohol, cherry, cola, vanilla, cinnamon, nutmeg, blackberry and plum. The finish is somewhat short, which is surprising considering the intensity of the aromas and flavors. The alcohol is a little out of character for the rest of the wine. The acid is pronounced and will tame a little with a few more years in the bottle. Right now, this wine is drinking very young. It is approachable but a little bit more time in the bottle might give it better balance. We visited this wine again the next day and some time with air helped. Decant this wine before drinking for the best experience and pair it with rich meat dishes that have some fat. Barbecue, empanadas, steak. This is a good and well-crafted example of Argentinian Malbec. Clear deep purple, medium tannin, medium acidity, medium alcohol. The nose is intense, showing blackberry, black plum, raspberry, vanilla, toast, rose, smoke, a hint of roasted meat, baking spice. The palate is similarly intense but a little more developed than the nose and is dominated by blackberry, baking spice, vanilla and smoke. Lovely, silky mouthfeel. The tannin and acid are very well balanced and integrated with the fruit. Lovely long finish and quite excellent with food or just on its own. Very pleasant to drink now or keep for 1-2 more years. The softness and approachability of this wine make it a good pair for a wide range of foods. It was nice with the chili, the spicy notes in the wine blended and enhanced the spices in the chili powder. I would also pair this with duck or pork in a fruit sauce, Mexican food, backyard barbecue and robust cheeses. With a suggested retail price of $13, this wine has great quality to price value. The overall standout wine for me was the rosé. I love rosé period and I especially love rosé with Mediterranean food. The color was super cheery on a chilly winter night and sipping this and eating olives and baba brought me right back to summertime patio dining. 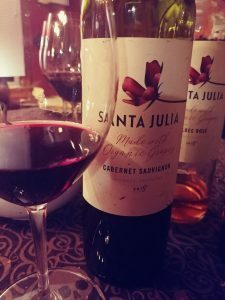 Dan and I tend to drink more old-world wine than new world although one of our 2019 resolutions is to change that up a little and explore more of the Southern Hemisphere’s wines. What really struck me about the two wineries we sampled this week was how flexible and elegant these wines were. 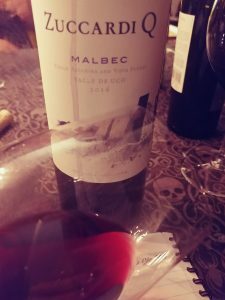 Malbec is Argentina’s best-known grape and there are a lot of not so good examples of that wine in the US market. I also haven’t been enjoying bigger, tannic wines recently. So, I will admit to having a little prejudice coming into this tasting. These 6 wines really opened my eyes to how much Argentina’s wine industry has grown over the last decade. None of these were the aggressive, tannic and fruit-forward juice bombs that I was cynically expecting. The surprise pairing for me was the Malbec. Although this is a grape that generally wants to be paired with meat, it worked okay with the chili, especially once it was loaded up with some sour cream and guac. Malbec needs fat to help round it out. Despite my current preference for a very different type of grape than Malbec is, this is the wine I kept reaching for that night while we were eating. The Santa Julia Mountain Blend was what I went for after we’d cleared the food and were just chatting. Feeds 4-6 as an entrée or brunch main. If you haven’t heard of this dish yet, you probably will soon. There’s a place in Champaign that has been putting it on their brunch menu and I also saw it on a menu in New Orleans when we were there last month. I’m glad to see Tunisian cuisine getting a little love. This is also a really good way to use leftovers or things that are sitting around in your fridge. This is one of those “family” dishes that vary widely from household to household. Some people cook it with meat, others never put in meat. Traditional Tunisian shakshouka doesn’t use meat, but when it is used lamb is the meat of choice. The only special ingredient you need is harissa. I use the Mina brand, which I can get at my local somewhat upscale grocery store. Harissa is a hot pepper paste that’s common in North African dishes. I tend to find the brands which are sold in America to be more on the mild side, so I either use a lot of it or supplement with a fresh spicy chili pepper like a Fresno. In Tunisia, harissa is also served as a condiment or a dip. 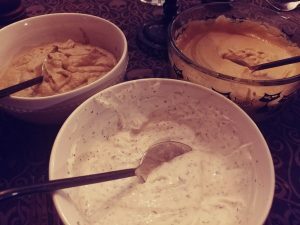 The brands sold here aren’t thick enough for that (it’s more like a sauce) but you can add some harissa to yoghurt for a flavorful dip for pita, chips or vegetables. 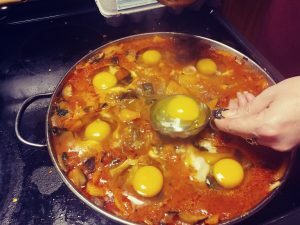 I learned how to cook this dish while I was studying Arabic in Tunisia in 2017. One of my teachers taught me how to make it as a way to learn the names for foods in Tunisian Arabic. We went to the market to buy the ingredients, laughing a lot at my valiant attempts to complete whole transactions in Tounsi. Making this brings back so many fantastic memories and it’s become a regular staple meal at home. It’s best with a bold rosé. Tunisian wine is awesome, but very hard to get in the US. Moroccan wine is a bit easier but Southern French wines are the closest regularly available wines that match the flavor. Heat 3 tbsp olive oil in a large frying pan. Add the onion, eggplant and peppers and cook until they begin to soften. 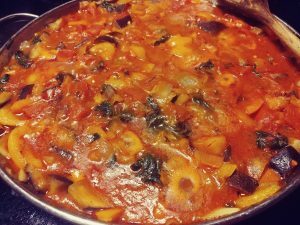 Add the garlic, chili if you’re using it, and mushrooms to the pan and cook until soft. Push the vegetables to the sides of the pan, creating a ring in the center. Add the can of tomatoes or the fresh tomatoes and whisk in the harissa into the tomatoes to make a sauce. If you’re not familiar with how hot your harissa is, add it gradually and taste until you’re at the level of heat you prefer. Stir the vegetables into the sauce and add the herbs and spices. Check for consistency – it should be somewhere in between a stew and a soup. You need to have some liquid for poaching the eggs. Add additional olive oil for flavor and water for consistency if needed. Let simmer for about 15 minutes until the vegetables are cooked through and all the liquid is hot. To poach the eggs: take a ladle and create an indentation with the back into the shakshouka. Crack an egg into a small bowl and slip the egg into the indentation. Repeat for each egg. Leave the dish on the stove at a simmer until the eggs are cooked as desired. I prefer to let the whites set and leave the yolks runny. You may need to cover the pan to help the eggs fully set. If you’re pressed for time, slide the pan into the oven if it’s oven safe and bake at 300 until the eggs are set properly. To serve, spoon some cous cous into a bowl and spoon out two eggs per person with the vegetables and sauce and serve with flatbread or pita and yogurt. Put the harissa out on the table to use as a condiment if people want a little extra heat. I usually make a mezze course to go either before or with the shakshouka. 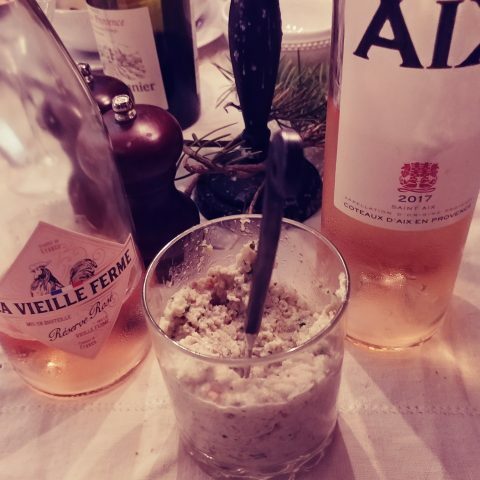 We enjoyed the Santa Julia rosé with baba ganouj, hummus, yogurt dip, olives and feta cheese and drank some of that with the shakshouka before moving on to the reds. 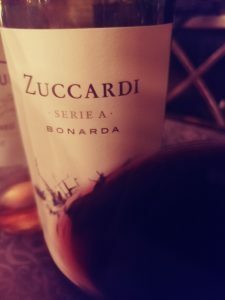 Rosé is always a perfect pair with Mediterranean and Middle Eastern foods as are the light reds like the Bonarda and unoaked Cabernet Sauvignon we tried. Heat oil in a frying pan over medium heat and preheat the oven to 300 degrees. Add the onion and sauté until soft. Add the garlic, spinach and shallot cook until soft. While the onion and spinach mixture is cooking, remove the stems from the mushrooms, put the caps in a shallow baking dish and chop the stems. Add the chopped stems and 3 tbsp butter to the pan and cook until the stems are soft. Remove the pan from the heat and stir in the cheese and Italian seasoning. Add salt and pepper to taste. Add enough bread crumbs to bind the mixture slightly. You may not need a full tablespoon. Spoon the mixture into the mushroom caps. In the same frying pan, melt 3-4 tablespoons of butter. When it’s melted, add the garlic powder and persillade or parsley and swirl to combine. Sprinkle the cheese over the mushroom caps and drizzle with the garlic butter mixture. Bake for 10-15 minutes until the cheese topping melts and the mushroom caps are cooked. 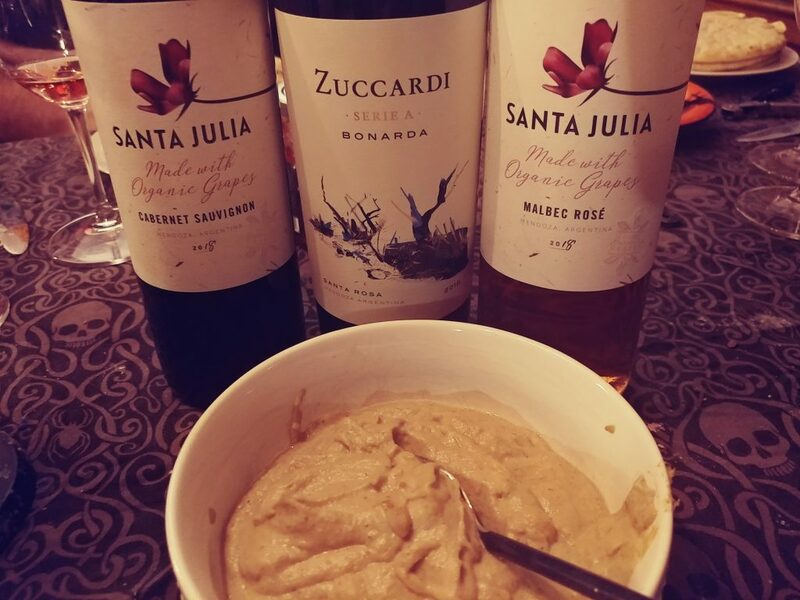 love the idea of North African cuisine with these Argentine wines. Inspiration! Oh my…your recipes sound amazing. 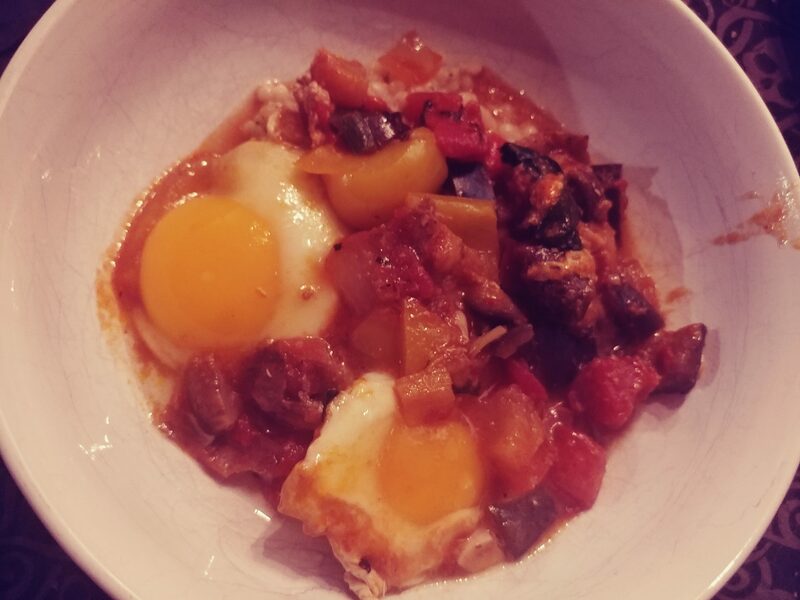 I love Shakshuka. I have also made a beet version that turned out lovely. 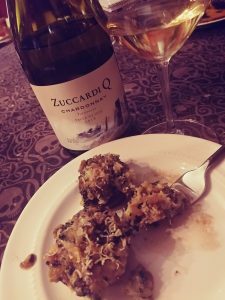 I can see the wines pairing very nicely with the meals you served and I appreciate getting some more meatless meals to add to my repertoire. Love these meatless dishes to add to the pairings! Great picks and wonderful notes on the wines! Your recipes are a revelation! I better get on the Shakshuka train. And it is always fun to try new wines. Go Bonarda! I love Shashouka! Everything looks delicious.